“They’ll never clone ya/You’re always first on the line,” David Bowie quipped presciently in the lyrics to “Boys Keep Swinging,” from his 1979 album, Lodger. Ever since the influential British rock star’s death in early 2016, there have been numerous tributes to him across multiple music genres and artistic disciplines, but few have come close to capturing Bowie’s idiosyncratic, chameleonic sound and expansive vision. 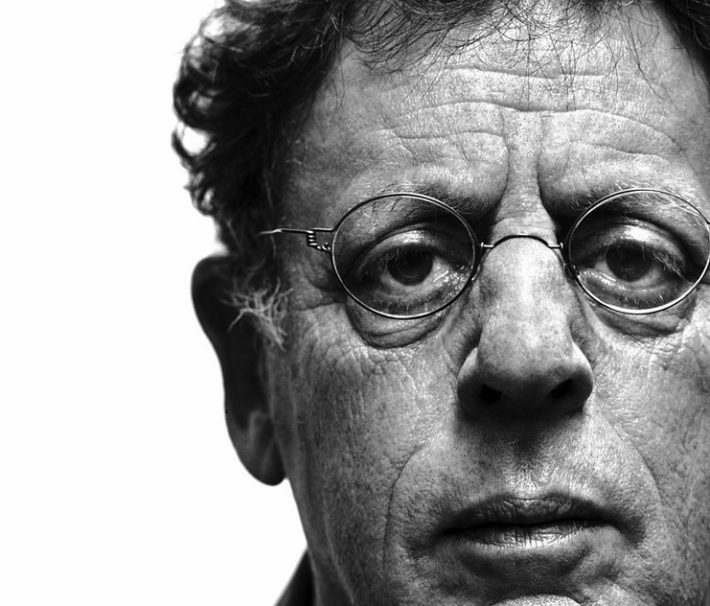 But Philip Glass’ Symphony No. 12, Lodger — which received its world premiere via conductor John Adams and L.A. Philharmonic at Disney Hall on Thursday, Jan. 10 — is nothing like the other homages that have cropped up in the wake of Bowie’s death from cancer. The new work is the third symphony by the New York composer inspired by the Berlin Trilogy, the three boldly experimental, electronica-laced albums that Bowie created with former Roxy Music synthesizer player Brian Eno in the late 1970s. Glass began this cycle long before Bowie died, back in 1992 with Symphony No. 1, a full-length extrapolation on the startling, moodily experimental music Bowie crafted with ambient auteur Eno on the 1977 record Low. That was followed in 1996 by Glass’ Symphony No. 4, which was based on Bowie’s 1977 studio album, Heroes. As on the original album, Glass’ Lodger started Thursday night with “Fantastic Voyage,” but it was not a literal, faithful remake merely gussied up with orchestral backing. Instead, Glass took parts of Bowie and Eno’s original lyrics and music and repurposed them into recurring themes that undulated in the composer’s trademark style of layered repetition. The principal soloists were Beninese vocalist Angélique Kidjo and British organist James McVinnie as conductor John Adams, dressed in black, led a fairly large version of L.A. Phil, whose musicians were all similarly clad in black. Decked out in a floor-length purple-and-white gown with matching head wrap, Kidjo was often a bewitching presence as her rueful, majestic vocals slowly burned over McVinnie’s circling patterns, which alternated between church-y reverence and bursts of circus-y garage-rock. Murmuring, shuffling strings came and went, with Adams occasionally pulling up the volume dynamically. The near-capacity audience generally remained quiet between songs as “Move on” led into the incantation “African Night Flight,” which was initially distinguished by Kidjo’s mesmerizing delivery. When Glass is at his best, such ongoing patterns can be hypnotic. But there were times in Lodger when the composer eschewed Bowie and Eno’s compact arrangements and stretched out relatively simple melodies and ideas to excess. On Bowie’s album, the songs are generally under four minutes apiece, but several of Glass’ symphonic extrapolations, such as “Yassassin” and the aptly titled “Repetition,” felt much longer, without instilling a compensating sense of depth or mystery. Rock & roll verse and chorus structures can be maddeningly simple, so many tunesmiths like to vary things a little with a bridge or instrumental break, but Glass prefers to riff on a single repeating theme almost meditatively. When it works, the effect can be sublimely transfixing. When it doesn’t, as in the lesser portions of Lodger, Glass’ flurries of swirling keyboards come off like an overlong Stranglers outtake. At times, Glass’ reimaginings of Bowie’s Lodger songs worked as alternate, weirdly hollowed-out and mutated extended mixes of the original versions. L.A. Phil’s mighty basses marched like mountains with a low-buzzing, synthesizerlike menace as McVinnie pumped up “Boys Keep Swinging” with funereal horror-movie organ lines that stomped up and down the staircase of Dracula’s castle. (With such works as his 1998 score to a rerelease of the 1931 film Dracula, Glass has made vampires a recurring motif in his music over the past two decades.) But Glass’ interpretation felt like a missed opportunity. “Boys Keep Swinging” didn’t really swing — nor did it try to — as Glass gave this and other songs only a simple sense of percussion that felt tepid and half-hearted compared with Bowie’s smartly funky and swaggering tempos. Despite Kidjo’s innate charisma, she often was given flat, emotionally unvarying reductions of Bowie and Eno’s lively vocal melodies, and what was intended to come across as contemplative sometimes felt lugubrious instead, along with occasional timing problems. “Red Sails” initially felt too slow and somber, but the melancholic strings eventually gave way to an impressive, satisfying and enchanting finale, with Kidjo’s voice cleaving through the triumphant horns and percussion with a fiery intensity. It was a reminder that tributes to Bowie’s music don’t have to be slavishly faithful remakes to capture his essence. “Red Sails” worked because it felt like Philip Glass just as much as it reminded of David Bowie and Brian Eno. The program included two other ambitious works. The first, Tumblebird Contrails by Gabriella Smith, began with an evocative fluttering of waxy strings and a bass section that lowed like jet engines before winds and horns entered like a gleaming sunrise. The brass rumbled like fog horns as Adams led the full orchestra into a chaotic storm, which subsided with French horns sounding like conch shells. There was an icy, faraway echo of seagull cries, then a searing invasion of horns washing over everything like a large wave. The 12-minute piece closed with a lulling interplay of waves, with just a flickering glow of flutes before even that lovely, ephemeral interlude was washed away into foam and sand and time. Before intermission, Adams conducted his own dramatic and strangely enchanting 1982 work, Grand Pianola Music, which featured pianists Orly Shaham and Marc-André Hamelin at matching black pianos in front of a small, 20-member variation of the orchestra. The piece required a lot of horns and percussion, but there were no strings. Grand Pianola Music began with flickers of flutes and piano delicately wrapping themselves around each other with a candied melodic sweetness. Winds piped in with staccato, insistently rhythmic patter as a trio of vocalists — sopranos Holly Sedillos and Zanaida Robles and mezzo-soprano Kristen Toedtman — burst through with sheets of ethereal keening. Momentous horns loomed over the beehive of violins, scattershot percussion and curlicues of febrile yet pretty piano. As conductor, Adams maintained a judicious restraint, saving his dramatics for the boldest parts. Shaham pushed the keys with a spiky, artful clarity as she and Hamelin rumbled their pianos, whose sounds grew outward into a stately grandeur as the reverential, breathy vocals finally gave way to a thunderous collision of brass and percussion. It was a night of new music that really felt new. Even Glass’ ostensibly nostalgic adaption of Lodger felt unpredictable, and it shifted shapes and patterns in ways that Bowie, a longtime and early fan of the minimalist composer, would have understood and appreciated.